One of the most consistent issues encountered in underground mines is the lack of reliable and timely energy infrastructure. Aggreko support critical mining infrastructure for underground mines, both for development and production, and the company has seen first-hand the challenges mines face and the complex, expensive and even hazardous obstacles they need to overcome. Reliable power distribution is needed for various stages of an underground mine’s lifecycle. From project planning and construction phases, through to commissioning and day-to-day operations, maintenance, repairs and emergency response, they all require a quality, reliable power supply and distribution that can match their levels of capacity in a timely and cost-effective way. 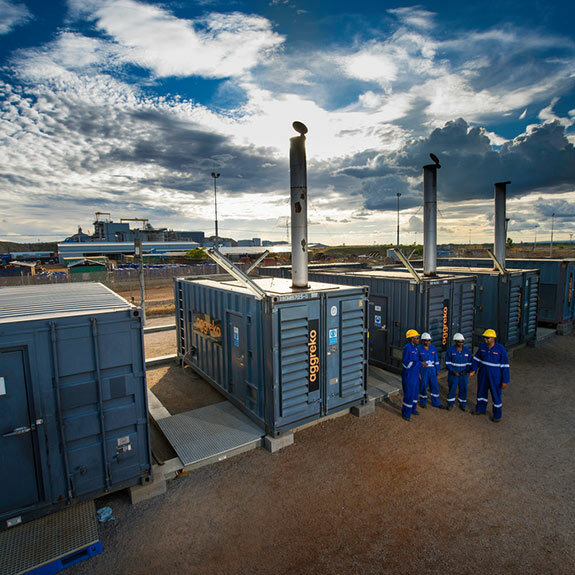 Aggreko’s projects, particularly in Africa and Asia, tend to be in remote locations with limited access to grid power, which, if available, is often unreliable. As many parts of Africa have little or no electrification, having a power provider that knows the territory is well-established and has a successful track record across the continent gives miners confidence. The company work in partnership to help get them up and running until they can reach full capacity, sometimes continuing as the sole supplier in remote areas, or providing a bridge until they can connect to the grid. During the exploration and feasibility phases of a mine’s lifecycle, not only is access to electricity required to power the necessary technology and infrastructure, but consulting expertise on the mine site’s capacity demands is also key. During construction, campsites can demand anything up to 500 kVA from the company's generator fleet. Powering the construction phase in remote or inhospitable locations can be especially challenging. 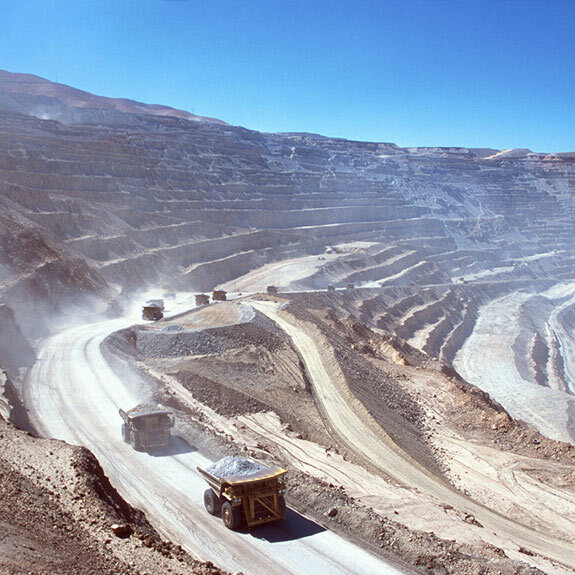 An example is Corporation Chilene del Cobre (CODELCO), the world’s largest copper producer, which needed a power supply for the construction and development of the ‘Gaby’ copper mine in Northern Chile. As the mine is located in the arid Atacama Desert, it was crucial the mine, and its 4000 workers, had reliable power. The company helped power the site through small generators distributed around the mine. A 5 MW high voltage mains power package, comprising generators, a transformer, bulk fuel tanks and control room office, followed soon after to provide the total power requirement. Furthermore, where machinery is concerned, there has been a recent growing demand in the industry for rapid excavation to reduce development costs, with more underground mines using mechanical excavation rather than drill-and-blast methods. Tunnel boring machines (TBMs), jumbos and continuous miners require a reliable power source as they are crucial for the early stages of a hard rock underground mine. A worst case scenario for a mining business would be for it to be rendered operationally unsafe during extreme peaks in temperature. Above ground temperatures in places such as Australia and South Africa often reach more than 45°C, which can put health, safety and productivity at mines in jeopardy. Controlling and regulating temperatures underground, as well as extracting moisture and contaminants, go a long way to ensuring that miners’ welfare and productivity is preserved when the boundaries of mining exploration are pushed. However, it is not only the operation of processing or excavation equipment that requires a reliable and flexible power supply and controlled temperature; ventilation systems also play a crucial role in an underground mine’s infrastructure by removing harmful fumes that occur during the extraction process. As companies push the boundaries of mining exploration, by digging deeper and in more remote locations for higher grade ore bodies, temperature control and ventilation take on an ever-increasing level of importance. For example, gasses can be combustible and therefore a fire risk, particularly in the case of coal mines. In uranium mining, radioactive radon gas can be harmful to health, as exposure can cause lung cancer. Drills, pumps, load haul dumps and other mobile devices that are often powered by diesel can all contribute to air temperature underground. Essentially, an effective cooling and ventilation system reduces these risks, while allowing for optimum productivity in challenging conditions. Aggreko’s underground temperature control at Peak Mines goldmine in Australia. Air cooling power is a major contributing factor to the overall improvement in working conditions underground. Both scientific research and common practice show that heat exhaustion is far less likely to occur if ventilation and refrigeration achieves air cooling power greater than 250 W/m2 at an underground work site. In the event of an extraordinary rise in surface temperature, where existing equipment is unable to reliably produce the increased cooling or ventilation, miners face possible shutdowns unless they have a backup plan in place. Aggreko worked with an intermediate mining company in Australia, which was experiencing wet-bulb temperatures in excess of 30°C at its gold mine located in the Cobar mining district, approximately 600 km northwest of Sydney. The high temperatures in the mine meant that miners working underground were working for reduced periods. The high temperatures posed a significant health and safety risk and negatively affected productivity. Operations were 1.2 km underground and air shafts at the mine measured 11 km in length, so the mine’s operators needed a way to chill the air in the fresh air decline and reduce the ambient wet-bulb temperature. The company worked closely with the customer and provided a 1800 kWr (600 refrigeration tonne) scalable cooling solution, comprising bulk air coolers connected to the mine’s fresh air decline, along with chillers located in the return air risers. The package met or exceeded all QHSE requirements for mining operations at the necessary temperatures. For deeper and more remote sites to be safe and productive, it is imperative that temperatures are controlled and regulated, with moisture and contaminants extracted from the air. The continued analysis and development of such technology is essential to the future of the mining industry. 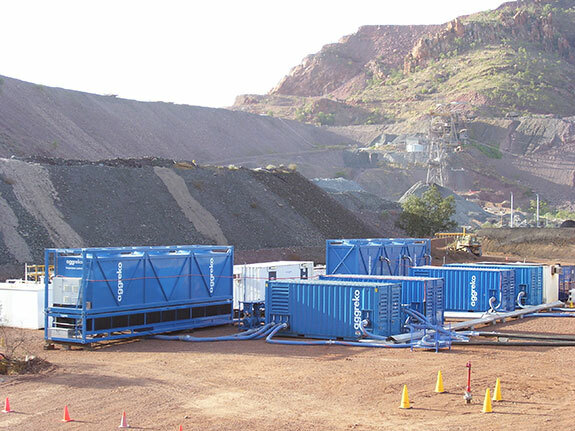 It appears mining operators are increasingly turning to modular power when installing the critical infrastructure necessary, particularly in remote locations. Temporary energy strategies are now more in keeping with the type of mining frequently encountered across the industry and its flexibility is proving a match for its increasingly transient nature. As the lifecycle of a mine has reduced in recent years, it is becoming increasingly impractical for exploration companies to invest both time and funding in the development of a permanent power infrastructure for such short-term projects, especially when the equipment is likely to remain unused once the mine has been decommissioned. When a mine is closed, rental equipment is simply removed and reused elsewhere – it is the sustainable option that does not drain local resources. Aggreko at Barrick gold mine, Kahama, Tanzania. The demands and challenges the industry faces are constantly changing, therefore a flexible and scalable power supply more suited to shorter underground mine lifecycles is essential. Critical infrastructure requirements of underground mines are evolving and modular, temporary power has evolved with the industry – from a backup in times of crisis to an essential cog in the wheel, which keeps an underground mine operational. Jordan Armstrong, Aggreko AUSPAC, Australia.